Listen to the instructor while you view the powerpoint slides. Just like attending the lecture in person but you can review at your leisure anything that you missed the first time around. 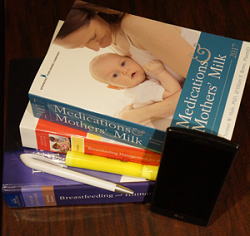 These online self learning modules are presented by an International Board Certified Lactation Consultant (IBCLC) with over 25 years of clinical and teaching experience. They provide the basics of lactation management for those with little previous experience or training as a breastfeeding counselor and meet the requirements for breastfeeding support training required for DONA doula training.